Monster Effect: Cannot Special Summon Fusion, Synchro or Xyz Monsters using this card as a Material, except "Dracoslayer" monsters. 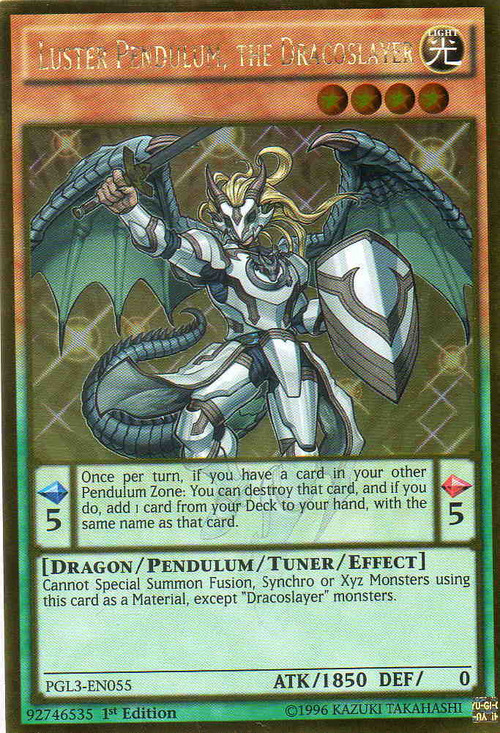 This card is the first Tuner Pendulum Monster released, despite having been the second Tuner Pendulum Monster revealed, following Nobledragon Magician. 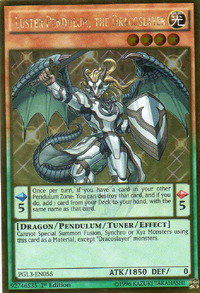 This monster's has an enhanced form, Master Pendulum, the Dracoslayer. This monster appears in the artwork of Dinomic Powerload, where it fuses with Dinomist Plesios and Dinomist Stegosaur to become Dinoster Power, the Mighty Dracoslayer. As Ignister Prominence, the Blasting Dracoslayer, this monster wears the armor of Igknight Margrave. As Majester Paladin, the Ascending Dracoslayer, this monster rides Majespecter Unicorn - Kirin. As Dinoster Power, the Mighty Dracolsayer, this monster wears Dinomist Plesios and Dinomist Stegosaurer as armor.